Using mason jars to display and serve mini trifles is a unique way to please your guests' taste buds... Fill with your favorite cake/icing combo- or use this one for Rich Chocolate Almond Citron Trifles! To make orange flavored & tinted frosting add 2-3 drops of almond extract and 5-6 drops of orange food coloring. 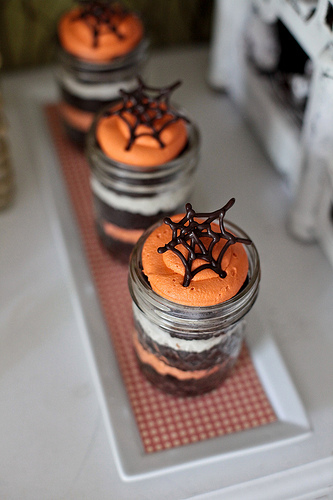 Top with chocolate spider webs or your choice of halloween themed candy.